This has been one of the oddest weeks in recent memory with snow episode after snow episode occurring during what's typically considered the heart of meteorological spring (March through May). It's proven to be a challenge for forecasters as well. We spoke with local forecaster Tom Novak of @NovakWeather to get a sense of how well he thought forecasters did with this week's long-duration storm. We know that consumers have their own perspective, but we thought it would be interesting to hear from a forecaster on how well he thinks this storm played out according to predictions. Does Tom or anybody else know if spring will ever come? Rhe forecast reads like abroken record stuck on the phrase "rain and snow..."
Well @Dennis did you watch the video? That little nugget that Novak gave at the end,Accuweather has already started the hype on it calling for a "major storm potential from Colorado to Minnesota", with the entire state of Minnesota painted in the significant snowfall. I know every winter is different, but this must be payback for hitting 80 in March last year, please Mother Nature make it stop! Euro predicts all highs in the 30s thru 4/21. GFS predicts *one* day with a high of 50+ thru 4/28. Never seen anything like this, just like I had never seen anything like March 2012. I guess at this point I'd settle for "normal" weather. NWS- "this could end being the largest snowfall for most of the area fr the entire winter season". 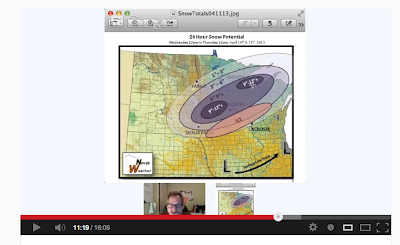 MPR/Star Tribune on their blogs had full disclosure of the dueling models,with some showing total as high as 15-20 inches.MPR also referenced the Halloween Blizzard that we didn't expect that to occur and look what happened! KSTP(Ken Barlow)- the use of the word "historic"
Bill/Novak video- In one of the videos Novak made a comment about how he didn't want to divulge his age but in all the years of weather forecasting he hasn't seen anything like what was about to unfold and said it was "unpredecented",as well applauded NWS aggressiveness and "taking the lead" with their much higher totals,which to some might have felt okay some other mets are now verifying the thinking of the NWS. What also played aganist this storm was it was a long duration event,it snowed and stopped it snowed and stopped,so with it being April it allowed the snow to melt so it had the look of "this isn't so bad",instead of getting one big 12 hour dumping or being in the middle of winter and the snow just keeps piling up. That's my two cents and just my opinion,again this was not a bust and keep the videos coming Bill/Novak because I think their great and informative beyond what you get on TV and I really want to know if another snowstorm is in the cards for next week! BTW,looks like another round of winter precip going to rain late Satuday into Sunday in the metro with winter storm watches as close as St.Cloud! Great stuff, Big Daddy. Just FYI, I'll be heading out of town for several days so there won't be any videos until maybe Tuesday night. Paul Douglas says mid-week storm stays south of our area,saying brunt of moisture goes south and east of us.So did we dodge another wintery bullet?or was this just one model run! This is a storm that keeps on giving.....another coating to 1/2" of snow overnight,this must be some sought of record for April, we have had some sought of wintery precip for parts of 5 consective days now! NWS confirms PD's thinking saying in their discussion heaviest precip mid-week will be south and east of the area,what do you guys(Novak,Duane,Randychamplin,Randy Hill) think about the mid-week system? One side note about our latest snow blitz,the snow we received brought us over our average April snowfall, as well as our average snowfall for the season and this continued chill will guarantee us a 3rd consective month below average temperature. Could be an icy start to your Sunday morning before the rain changeover,be careful out there,NWS says a WWA may be warranted for the twin cities metro! Differences,differences. NWS has put out another winter headline(winter weather advisory) and speak of snow,sleet,freezing rain,up to 1-2" of snow, yet Novak has no travel impact whatsoever for the immediate metro.Who wins! Paul Douglas--"next week's big storm tracks to our east".Enough said, can we get on with spring now! Here in Owatonna we have a nasty coating of ice on everything, and the temp has yet to move at all this morning. The freezing rain continues. Road conditions here are worse today than this last bust snow event. Overhype one day, underhype the next. I have to admit. I'm a bit surprised at how long the near freezing temps are sticking around today. I expected temps to warm above freezing shortly after sunrise. Granted, the freeways and heavily traveled roads are not a problem, but the rural roads & side roads are definitely slick. Strong easterly winds are not helping either since they advect cold, raw air into the storm system. Eastern ND & nw Minnesota should get buried this PM. I can't see how they escape 6"-12" of concrete-like snow. Not good for the flooding situation up there. BTW, a forecaster can't win today. If you hyped this AM's weather, people will be upset because we didn't get any snow. If you downplayed this AM's weather, people will be upset because it is slick outside. You can't say that forecasters didn't warn everyone of rain/mix this AM. Thanks for the honesty Novak,yes you did downplay this mornings weather, well even this afternoon's since its about 1:30, just toke a short trip from Bloomington to Edina and back again side streets and sidewalks are really slick with a good coating of snow/sleet/slush and my temperature gauge is stuck on 32, what happened to the warmer air? Currently an icy/sleet mix falling, yes major highways seem fine but be careful of those side roads. Novak I do have a question for you, what do you consider a travel impact?, because your maps didn't have anything close to the metro, but I think conditions around town warranted some kind of "heads up" like the winter weather advisory placed by the NWS. Icicles on trees, traffic lights and vehicles all afternoon in Burnsville. We're still sitting at 32 degrees. As of 4:48 p.m., the NWS is still claiming there will be a high of 47 today in Owatonna. 33 degrees now and dropping. I wouldn't mind this weather nearly as much if I didn't have a toddler with a dangerous case of cabin fever. I know car thermometers aren't all that accurate but I have been running around the west metro and it hasn't moved from 32 all afternoon, is this slop going to turn to ice as night falls?will rain turn back to snow? There is some serious glaze on trees around town! I consider "Travel Impact" to be generally associated with heavily traveled roads such as freeways & county roads. I don't consider side roads, streets, etc. in on the graphic. In other words, this graphic mostly pertains to those who have to travel a significant distance. In today's scenario, I didn't expect any of the heavily traveled roads to encounter dangerous travel since I believed that surface temps would rise above 32 over much of southern and eastern MN. Also, I was confident that snowfall would be minimal if any accumulation at all. This would keep roads wet rather than slushy/icy and snow covered. As you can tell, I usually place the dangerous weather along and NW of the surface low track. As far as the "warm" air is concerned, it kind of arrived, but at 850mb & 700mb levels. That is why we are receiving ice and rain in the metro this pm. Again, the lowest layer of our atmosphere, right near the surface, simply didn't warm as much as I had thought. The strong easterly winds kept on advecting cold air into the system at the surface. From time to time over the last few weeks we have heard rumors of a warm up being around the corner, quite frankly I didn't believe them. This time I'm buying into it. For the first time this spring it looks like we have model agreement on flipping the PNA (Pacific North American Oscillation) strongly positive during the last week of the month. That means that a ridge should be somewhere out west. Upon looking, the ECMWF,GEM and GFS ensembles all show that at 240 hrs a decent ridge starts to build. The GEM and GFS ensembles go out further and they show the axis of the ridge riding up as far as the north as the northwestern Provinces of Canada. At the same time a trough will develop over the Gulf of Alaska and drop south just off the west coast, this will act to push the ridge further east. While the ridge moves towards us the AO (Arctic Oscillation) goes negative and a cold trough should drop over the eastern part of the US. All of this could possibly trigger a omega block bringing warm and dry conditions to our neck of the woods, as a matter of fact it could get humid as well. First off I wanna say it was a pleasure meeting DDwx and Bill on Saturday at the spotters workshop in Minneapolis. It's always nice putting a face with a name, although I already knew what Bill looked like. On that note, the models decided to throw yet another curve at us...bringing that system closer to the area. Right now models show two areas of low pressure forming, one pretty much right after the other. The first, at the moment, would mostly be rain. The second, however, could end up bringing yet another accumulating snow event close to home. As this system cranks up to the south, it looks like the severe weather season will finally be kicking off across the southern plains. A day 3 moderate risk is pretty serious, but those events always have the biggest bust potential because they are well advertised several days out and if they don't exactly pan out exactly how people think, they call it a bust. Anyway, this week is yet again looking active. Really hoping the warm up that has been showing up about 10 to 15 days out actually comes through. Honestly, I'm ready to be looking at the SPC maps as opposed to the HPC maps. Lets turn the corner on winter, and get into spring. I do agree with Randy though...and believe that the warm up that is showing is legit. No telling how long it will last though. In the meantime, keep an eye on this storm system Wed through Fri.
NWS questions the extent of the warming in their discussion,however being late April next week it has to be warmer then 20+ degrees from departure were experiencing now! I would image this weeks system will be winter's(now spring)last hurrah! Also in the NWS discussion, something I brought up a couple days ago, MSP has seen measurable snow for 6 consective days in April....truly amazing and rare! Great to meet you as well Duane! The GFS is showing 60s during the last week of April, but we all know what that's worth. The Euro is still showing highs in the low 40s as of Wednesday 4/24. Dave Dahl: "at least a couple of inches of snow" for Wednesday night-Thursday! Right now it looks like this next storm will come in two pieces. Rain is likely with the first wave Wednesday night into Thursday morning. Snow is looking likely Thursday night into Friday as a decent deformation zone sets up near or just to the south of the metro. I don't expect huge snows, but 3-6" wouldn't be out of line wherever the heaviest band sets up. If you interested in severe weather, more specifically tornadoes, I wrote a blog post yesterday outlining what I expect for tornadoes from now through June this year. Looking back at recent cold March/April's, this year is most similar to the springs of 96 and 97. It looks like we could see a very active May and June. You can read the full post at chasetheplains.com.